BRIG. 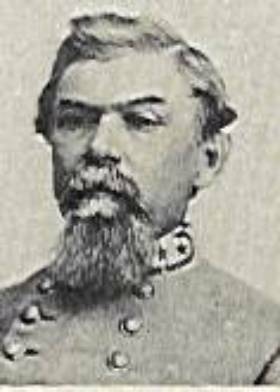 GEN. W. J. HARDEE, C. S. ARMY. William J. Hardee, despite his outstanding military career, would most likely be a footnote in American history, were it not for his masterpiece of drill, Rifle and Infantry Tactics. Hardee was born in Georgia, in 1815,and received an appointment to West Point, graduating 26th in his class, in 1838. He served with gallantry in the war with Mexico, receiving two brevet promotions for his service. In 1853, at the urging of Secretary of War, Jefferson Davis, Hardee, then a Major, with the brevet rank of Lt. Colonel, began work on a new, updated manual, specifically designed to utilize the advantages of the improved rifles available. In 1855, Hardee's Rifle and Light Infantry Tactics became the standard instructional manual for the U.S. Army. Hardee's work assumed that troops would be armed with the model 1841 "Mississippi" rifle, a two band weapon that had achieved popularity during the war with Mexico. He revised his work for the popular three band rifled percussion musket, which became the standard shoulder arm of the American Civil War. This revision was published in Mobile in 1861, and again in an edition for North Carolina Troops, in 1862. This version has been reprinted, and is now usually referred to as the "1862 Hardee's", or the "Confederate Hardee's". This is the version published here. The project is now complete. The Evolutions of the Line, taken from Scott's three volume Infantry Tactics, are linked here to the Scott's files. Note that, while Hardee included the Evolutions of the Line, complete with references to the illustrative plates, the plates themselves were not reproduced in the 1862 edition of Tactics. I have no doubt made numerous typographical mistakes in this transcription, however, do note that in my own small way, I have attempted to be faithful to the original. This original printing was rushed into print, and contained many errors. I have retained them, as my goal is to transcribe the work of General Hardee not to correct it. The work has been divided into five parts, which can be accessed from the links below. The School of the Soldier has internal links, found at the contents portion of the document. Click on the Title Second link at the top of the document to find the links. School of the Company's internal links, come up quickly at the top of the page. Instruction for Skirmishers requires a short scroll down. The School of the Battalion's internal links are based on the division into lessons, and can be accessed from a link at the top of the page.